We are going to compare some very reasonably priced, but state of the art, computer software that works in conjunction with iTunes to significantly improve its sound quality. There are other more expensive software but they do not sound that much better. Some sound worse. Some are inconvenient to use. We are going to do our listening through excellent monitor headphones an are going to use the built-in DAC of a late-model Mac Mini running the Mountain Lion operating system. Most of the music we will use as source material has been purchased directly through the iTunes music store. A few selection have been uploaded from cherished CD’s. We will share our source material later. Of course, an outboard DAC can often improve the sound but it also adds significant expense. The MAC Mini’s DAC is quite good and will do for our purposes now. What we want to get across is that a glorious analogue type musical experience awaits you with very little cash outlay. If music is still the goal then we leave the enjoyment of listening to speaker wires and cables to others for the moment. Here is the software we used listed in order of ascending price: BitPerfect, $10; Fidelia, $19.99; Decibel, $33; Amarra HiFi, $49; and Audirvana Plus, $49. All are outstanding software products. Each one can be download directly from the manufacturer for a fifteen day trial period, with the exceptions of Decibel which has a 48 hours of usage trial period and BitPerfect which is so cheap they don’t think you need a trial period. They are right. It is a no-brainer to download as it serves as an excellent introduction to the great capabilities of this type of software. Decibel, with the shortest lasting trial period of 24 hours was also the least convenient to use with iTunes. Of course, the trial period may be extended over several days with judicious use. Decibel has a great reputation so I tried very hard not to be prejudiced against it, especially since it sounded so good. Let us get started. We started from the lowest price to the highest. BitPerfact can make your iTunes files sound closer to analogue than one might expect. It has an open and airy sound, slightly on the side of Technicolor and with a hint of grain. Nevertheless, it was very listenable and enjoyable. Old recordings seem to be more alive. 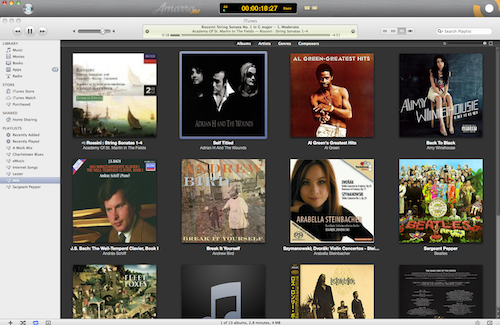 And BitPerfect offered the most seamless integration with the iTunes player. I enjoyed using it very much. Decible offers quite an excellent sound. It just seems more difficult to use than it should be. It did sound better than the more expensive Audirvana Plus by a nose as well as Fidelia. It is dramatically smooth and airy. Very musical and refined. Worth every penny with regard to its music reproduction. The Audirvana Plus is exceptionally easy to set up and use. It sounds very smooth. One might prefer it over Decibel simply based on the user interface, yet it takes somewhat of a backseat to both Decibel And Fidelia in my opinion. It is easy to listen to and many people might prefer its laid back presentation. Amarra HiFi was the most expensive along with Audirvana Plus, each costing $49. It has a lot going for it. First of all it is very convenient to use. Secondly, it had the best overall sound. The sound was very neutral with the absence of grain. It did not seem as airy on some recordings, but I discovered that when the air is already on the recording Amarra HiFi will reproduce that air the best. The more expensive Amarra can work independently from iTunes, has FLAC playback, and offers cache play which theoretically eliminate any distortion caused by a spinning disk. The price jumps from $49 to $189, however. You will have to be the judge if this still represents a good value. Channel D Pure Music is quite good but costs $129. I do not think it is as good as Amarra overall. All are available in the iTunes music store as downloads. They were chosen for their innate sound quality. I played several other titles but these will give you an idea of what the various software can do. All of the software candidates will offer a very audible improvement to the sound of your iTunes files. You might begin to appreciate Apple’s compression engine. To get this quality of sound in true analogue be prepared to spend a great deal of money on phono cartridge, tonearm, turntable, and associated playback equipment that will not degrade the sound. The overall cost can be astronomical. This is why Amarra HiFi makes a lot of sense. The software is really a steal at the price it is offered. Why not download a trial version and see for yourself? One thing to keep in mind. This software will not improve the sound of your iPod. However, another solution is available which almost turns your new Apple EarPods into audiophile headphones. You will not want to miss this review. JRiver Meia Center has been a nice choice for the Windows operating software computers. It is now being ported to the Mac. While the price is reasonable, what is not reasonable is the system setup. Only true audiophiles will want to go through the torture. I prefer to err on the side of simple and useful for the average music lover who does not want to fiddle so much. Time moves on. I have had to reevaluate my findings. Audirvana Plus is not the clear winner. See Great Souding Digital for Less.